Eomba Motomoke has more than twenty-five years of international development experience in program management, performance improvement, material development, training of trainers, and logistics system design. As Country Director of VillageReach in DRC, she ensures strong relationship between VillageReach, the DRC government, NGOs and donor partners. In addition, she establishes new partnerships to grow and expand DRC programs in line with VillageReach’s mission. She oversees the implementation of VillageReach’s programs in DRC, including the creation and monitoring of work plans, budgets, and evaluations. She coordinates VillageReach’s activities in DRC and provides regular reporting to government, other NGOs, and donors. She monitors program implementation, refines program strategies and plans accordingly. She maintains regular and substantive communication with headquarters staff, acting as the liaison between the DRC office and the Seattle office. 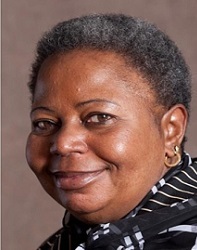 Ms. Motomoke has previously held positions at JSI as Capacity Building Director, Senior Performance Improvement and Logistics Advisor on the DELIVER Project, Senior Technical Advisor, and Organization Strengthening (OS) Technical Manager. As the Capacity Building Director on the USAID | DELIVER PROJECT, she oversaw the project’s capacity building activities, helped build the capacity of organizations and individuals to ensure the long-term sustainability of supply chain management/commodity security capability. She developed local expertise and supervised the development and deployment of tools and approaches. She supported the design of systems and train-the-trainer sessions in many African countries. From 1986–2000, at the US Peace Corps, successively as a language trainer, language coordinator and training manager, she taught, planned and designed training programs. She was also based in Ghana as the Regional Training Advisor for CEDPA from 2000-2003. She holds a bachelor’s degree in education and is a certified as an On the Job Training Expert. She speaks fluently six languages: English, French, Lingala, Tetela, Swahili, and Tshiluba.